The most basic conception of Hinduism is pan-theistic. 'God is everything, everything is God’ is considered the deepest ‘truth’ in what is regarded as the 'highest' form of Indian theology - Advaita Vedanta. This teaching figures in most Indian gurus, swamis and the variety self-styled divine beings in India (avatars, maharishis, bhagwans and so on. It is central to the so-called ‘teachings’ of Sathya Sai Baba, who claims to have created the Universe, and consequently everything in it, not least the Hindu scriptures as expressing as the purest and most universal religion. It is also though to be 'monistic' since it operated with one idea of God, whereby God is totally suffused throughout everything. Nonetheless it is pantheism. One rider to this 'theological theorem' is that 'God is everywhere' (Omnipresent). One major flaw in this conception is that, if everything is God, then God cannot be localised by any means, neither as a separate entity nor in any other distinct way. On some interpretations, it is tantamount to saying that God is also nothing (as expressed by the advaitic 'neti, neti' aphorism, which holds that God is 'not this, not that' (i.e. implying that God cannot be named, conceived or distinguished as such). "God is everyone, everyone is God" At the same time, some variants lay most emphasis on one consequence of the most vague generalisation (i.e. God is everything), namely that 'God is everyone, everyone is God'. Yet another more restricted variant is 'God is in everyone'. (These two variants are obviously not entirely compatible). The latter assertion is sometimes explained by saying that God is in everyone as a divine spark, or resides in the inner heart as universal consciousness or as (invariably occluded) eternal love or whatever. These ideas of God are much narrower than the original key idea that ‘Everything is God’. The vagueness of these tenets alone makes it possible for unsophisticated minds to accept them - with or without differentiation and without clearly understanding anything from them. They become slogans one believes and repeats... but which explain nothing. God as the inner reality Some variants of Hinduist pan-theism hold that God is only within you. Unfortunately, this contradicts the core idea, that God is everything. Other variants insist that God is both within you and outside you. However, this takes no account of the absence of any direct external evidence of God’s existence, for a start. Worse, it means that one cannot 'locate' the divine, so in no way can one find 'God' because 'it' is not distinct from everything, and God is everywhere so there is nothing that is not God. 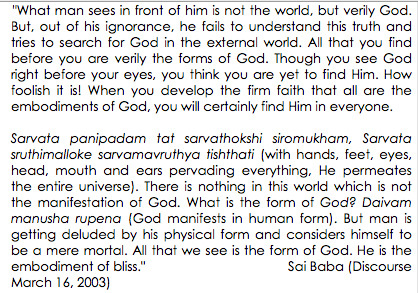 The response to this confusion by gurus is that you have not realised yourself, your ‘true nature’ as the Divine Being. (i.e. not merely as ‘a’ divine being, but the God who is everyone and everything)! God is represented as being hidden, behind the veil of human ignorance and so on. However, any being which is absolutely everywhere cannot be hidden. Thus, the crass absurdity of the entire conception becomes the more and more apparent as one explores it and its consequences destroy it logically and make it meaningless. Paradoxically, this pan-theism makes for the most tolerant of religions, since every religion (everything) must be a divine manifestation, nothing less. At the same time, however, belief in the pan-theistic thesis means one is totally exclusive of all mainstream religions, which all reject precisely pantheistic theologies… and pan-theism is itself a most exclusive theory which by its internal logic refutes all religious beliefs which limit God in any way. God is held to be 'omnipresent' and no less the quintessence of all that is right and good - yet the existence of wrong and ill is ignored. At best, it is said to be merely 'the lack of right and good' and therefore not to be real in itself. Yet if God is everything and everywhere - and vice-versa- then there is no room for absence or lack. Again the theology implodes into itself... imprecise thoughts, empty or conflicting words and metaphysical speculative 'answers' what have no basis in any known reality. What is the weakness, rationally, of the assertion 'I am God'? Do I have no limitations? It is, after all, only a speculative hope that I can ever realise full divinity so that nothing will hinder my consciousness, knowledge or will. Since I now only can at best recognise myself as being a part of God, my apparent limitations are great. Appearance, even though believed to be but appearance, is not fully realised for what it is and thus remains confused with my reality. Thus people worship God as greater than and other than themselves, singly or collectively. If we are ourselves God, why should we therefore ever need to concentrate on any other form of God than ourselves? 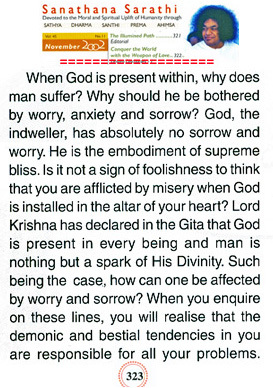 Why create any attachment - even a temporary one - to an inculcated or freely chosen God-form (Isthadeva)? People like Gurdjieff answered this by referring to methods of 'remembering oneself'. For example, in the struggle to overcome negativity in whatever shape or form it arises in myself, I am supposed to need a model of perfection upon which I can rely fully as being truly positive. That model is absent in myself under the circumstances or else I would not be experiencing any negative emotions or thoughts, or any kind of limitation whatever, even though it is really also my potential. This assumption of an overclouded but true divine nature is perhaps just an invented ideal… clearly it is not a known reality, but the ideal - that I could be God, Creator of the Universe and all the rest attributed to Divinity - is simply impacticable, to say the very least. It is an unrealisable miasma, no doubt developed by thosw who could not relinquish their hopes of it being real as a solace and intellectual enigma after the complete failure through the ages to find the supposed Creator and Ruler. If one accepts that 'I am God' this further implies that I am All... I must therefore see my Self reflected in everyone and everything. This is what is believed to be realisation of Self, its universal and divine nature enfolding the entire cosmos. The development of such an insight into a constant, unruffled awareness of the fact, whatever happens to oneself is the goal of the larger part of Eastern religion - the goal of our struggle to purify all feelings and fully to illumine the mind. The impracticability of the 'I am God' doctrine in real life. Because of its inherent confusion, this doctrine of omnipresent divinity also fails to work as a coherent social ideal or in providing a fruitful means to solving the practical problems and conflicts of life. An omnipresent God who or which is all goodness, light, might and right cannot coexist with 'evil', darkness, powerlessness and wrong. Not to acknowledge that these latter have any meaning is no solution, it is head-in-the-sand irresponsibility, resigning one's birthright to stand up against oppression, torture, depravity, murder and whatever else one does not think to be 'godly'. It collapses upon itself. The palliative is to deny the real existence of anything but the good, to try to explain away all the ills, sufferings and human evil... and to call on believers to "see, hear, and speak only the good" and promote similar denial mechanisms. The entire doctrine with whatever chosen ramifications is a product of illusion and confusion. Sathya Sai Baba has a standard answer - used by many 'spiritual masters' to the perplexity that arises in people about these claims. You have not realised the nature of your true self, your ‘essential nature’ as the One Divine Being in eternal bliss and consciousness. It sounds very attractive, no doubt, but whether any such 'realization' is achievable cannot be tested in any way one can rely. It is most easy to be misled by this, and for a lifetime too, in the hope and faith that one will reach Salvation, freedom from the insecurity, pain and sufferings of existence. It is easy to 'sell' to people who are dissatisfied with life, other people and the world. Once one commits to such a life course as spiritual aspiration to experience God, the almost endless labyrinth of obscure scriptures and undoubtedly clever rationalizations take many years to study and absorb. If one gives oneself to it fully it is very demanding, involving endless prayer and meditation and diverse other demanding so-called 'sadhanas'. The lengths to which yogis go are legendary, but why are they driven to such privations? Everyone must answer this for themselves, but it is wise not to neglect common sense and reason well-grounded in life experience. I witness to the fact that it is possible to recover oneself from such a well-meant project when its futility is revealed in sufficient clarity and depth. To break the spell of belief and gradually realise the illusions which it has created and which one's strivings have re-enforced in one's mind. But breaking out of any deep-seated cognitive disorder (of which such strivings are undoubtedly a clear and forceful example) can be very difficult, if not impossible. If one is fortunate, then what was made to appear like supreme wisdom and 'spirituality' reveals itself in wider and wider perspectives as one explores it further. This article is an example of the kind of investigation one must undertake in respect of all the many aspects of such doctrines and their attendant social, psychological and often financial bonds. De-programming one's mind is a liberation of one's autonomy and true, natural selfhood in many ways. After decades of the entire process of 'spiritual seeking' it can be turned to the good through the major learning process about the fallibility of the human mind and the many ways that it affords in hindsight.